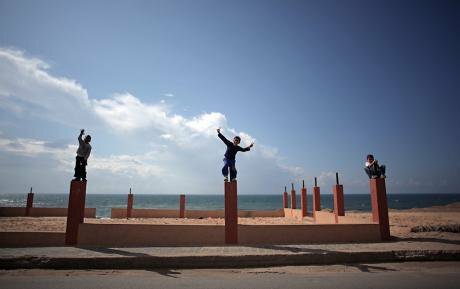 Playing on the beach of Deir el-Balah refugee camp, central Gaza Strip, Wednesday, April 13, 2016. AP Photo/Khalil Hamra. All rights reserved.Rosemary Bechler (RB): Ozlem Eskiocak, we were very pleased to publish an account of the UNRWA programme which every year looks after half a million Palestine refugee children in 700 schools, in the run-up to the World Forum for Democracy 2016. Let me just ask you first what you have made of the last couple of days here in Strasbourg? Ozlem Eskiocak (OE): It was a very interesting opportunity to hear ideas from around the world on education, democracy, participation. The way they have designed the sessions was quite clever, with the main presenter and discussants critically reflecting on the issues at hand. What I found most fascinating was the engagement of the audience. This is something that sets this conference apart from others that I have participated in. There was genuine dialogue, which is of course great, given the fact that we have democracy as a topic. For me also I enjoy the fact that we have many young people here. They brought so much to the table, energy and enthusiasm as well. I used to be a youth representative myself and during my time ten years ago, we wouldn’t be allowed into the main discussions. RB: Not into the plenaries? Oh, where were you? OE: In a separate room. Sometimes even in a separate building. We would be discussing among ourselves and then we would have a position paper which would be read in the concluding session of the last day, so there wouldn’t really be any genuine interaction between adults and young people in most of these conferences. So I was very happy to see that young people were genuinely interested in all these subjects and that they were given an opportunity just to interact with the rest of the participants as equals. RB: This won’t have been such an alien principle to you, given your project. Tell me more! OE: In UNRWA, while we have been delivering human rights, conflict resolution and tolerance education since 2000, recently as a strand within educational reform (2011- 2015), we have worked to strengthen our human rights education policy — and then develop tools which support this vision, emphasising critical thinking and encouraging children to engage practically. Students at the Russifeh Preparatory Girls School No. 2 and 3 in Zarqa, Jordan, commemorating Human Rights Day, held every year on 10 December. 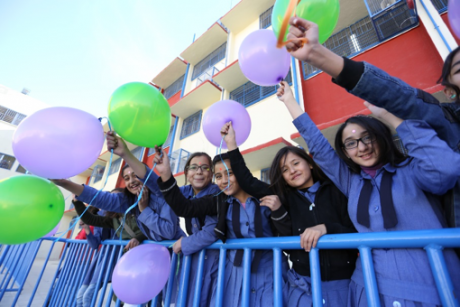 © 2016 UNRWA Photo by Mohammad Maghayda.The vision is for the Palestine refugee students to uphold human rights values, to know and exercise their rights, be proud of their Palestinian identity in order for them to make a positive contribution to their societies, and the global community at large. So through the Human Rights Education Programme, through practical, child-friendly activities, children learn about their rights, diversity, and the world they live in although they might never have left their refugee camps. It has a huge impact on them in terms of empowering them to become active citizens. These young people, they really don’t want to feel like victims: they really want to act and to instigate change. So when you give them the tools — which is all we are doing: facilitating a process for them to critically reflect on their situation — then they do wonders with this! For instance, after learning about their right to clean water, they were able to petition the authorities and bring clean water to their whole neighbourhood. In Jordan, there is ongoing emphasis on integrating people with disabilities into community life and into their schools and through our School Parliaments the students of UNRWA in Jordan are really engaging with this. Children take great pride in their engagement and in their achievements with regard to these important issues. The UNRWA human rights education programme is about the integration of human rights concepts into every subject they study. It is mainstreamed, not a scattering. So in a maths class, instead of calculating the proportion of apples and oranges in basket, we talk about real-life situations that matter to them; in this instance, they might work out the proportion of people in their societies with disabilities, and then the teacher would ask, “Why don’t we see these people among us. What’s wrong?” On that basis, they come up with projects to help people with disabilities, and that is what we mean when we refer to a 'human rights-based education'. RB: Aren’t you also educating them for disappointment in preparing them to be active citizens — what is their scope for activity in the world? They must want to travel. OE: Absolutely — they do want to travel, to meet with this diverse world and to discuss with children around the world. However, unfortunately a very limited number of refugee children can travel. They face such difficulties due to lack of papers and authorisation to travel. This is one of the reasons why we have come up with this My Voice, My School project. Through this project the students are connected to students in other countries through Skype calls. Last year, we connected three classrooms in Syria with children in the UK and in Belgium. This year, the project is running for a third year and is running through 12 schools located in the UK, the Netherlands, Germany, Sweden, USA, Gaza, Syria and Lebanon. RB: I saw one of the video exchanges between Syrian and UK schools and found it very moving, the way they got so much out of it on both sides. OE: Exactly, and that is the whole point. The aim is to ensure that the students get to discover points they share in common and to avoid Palestine refugee students being the subject of study. OE: No – what we want is for them to contribute to an ongoing debate with their peers elsewhere. That is why the My Voice My School project is about bringing children together to talk about a topic which is relevant to all of them, and supporting their preparation and reflection on this discussion to get the most value out of the Skype calls. For example, ‘quality education’ is one such key topic, as this is not only the aim of the global Sustainable Development Goal number 4, but of course it is a very important subject for both groups. What is very interesting here is that the students can advocate for a quality education both locally and globally. For example last year, the Oaklands School in London met with then-UK Secretary of State for International Development, Justine Greening on the back of the project. The British students wanted to find out what the UK Government was doing for students in Syria. At the end of the meeting with the Secretary Greening, Hafsa, one of the students said, “it was great to put our questions with someone in power, however we still feel sad to think about our friends in Syria.” This exemplifies the values we want to see in a global citizen, someone who cares deeply about someone else around the world, someone who cares passionately about other human beings and takes action to support them. RB: In My Voice, My School, I remember some of the English kids were saying, this is amazing the way they can speak English — is that a priority for your programme? OE: We do teach English in all our schools, but what is interesting is that the project appears to be a strong incentive to improve your English. The teacher of the Palestine Girls School in Damascus said all her students’ English marks rose. We have received very positive feedback from teachers who observed their students working extra hours to improve their English in preparation for the live online exchanges. Outside the scope of this project, in general, Palestine refugee students do not have many opportunities to practice their English or to interact with people from other countries. Especially in Gaza which is under blockade. You should see whenever I go to a school in Gaza, all of a sudden so many children pile up around me, and they just want to practise their English. They rarely see anyone from outside. RB: Do you find that there is a different commitment to education, that Palestinian children are really keen to learn, to advance themselves, because I sense that in my country especially boys almost have to insist that they are not interested in education at all, as a matter of self-respect? OE: It’s interesting that you should say that because this was one of the comments that we had from some of the boys in the UK. They said, and I am quoting them: “we must adopt Palestine refugee students’ attitudes to education and learning!” They really picked up on the fact that, even when UNRWA students were living in a context of war or conflict they remain committed to their education. RB: Wow, that’s quite an achievement: single-handedly you have budged something that has often proved pretty intransigent! OE: It is because education brings Palestine refugees hope, hope for the future, and it is where they socialise and where they feel safe. In Syria, children want to go to school because it provides them with a sense of normality. Although this is the case, historically education has not received the attention it deserves from the humanitarian sector. For example less than 2% of all humanitarian aid went to education in 2015. Only very recently during the World Humanitarian Summit, in May 2016, a new global platform for education in emergencies was established recognising the key role of education in emergencies. RB: But people can be sitting in these camps bored stiff for years on end. OE: Yes. And you need education to keep people alive and sane as well. It is very important for developing the safety of children. So UNRWA works to continue to provide education to its students in all circumstances. Even in the most difficult conflict situations we have an education in emergency approach, which includes self-learning tools and the UNRWA satellite tv, so that even if children cannot get out of their homes, we try to reach them through satellite TV, internet, moving libraries. It is very important that these children get education no matter what, and it is also a way of providing psycho-social support to them. 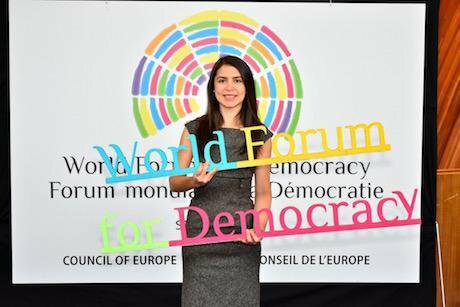 Ozlem Eskiocak, UNRWA Human Rights Education Programme Coordinator at 2016's World Forum for Democracy. Image courtesy of WFD and UNRWA. OE: Five fields: Gaza and the West Bank, Jordan, Lebanon, Syria. RB: Are there many differences between the programmes you run? OE: The situations of the refugees and the challenges they face are different, but at the same time, the experience of being a Palestine refugee is also very similar. In Gaza for instance, the most densely populated area in the whole world at just under 360 square kilometres, you only have a Palestinian community there. But in the West Bank, you have both Palestinian and Israeli communities. There, children see checkpoints, soldiers with guns, and they see violence every day in the West Bank. In Lebanon you have different challenges. You have this exclusion from the rest of society, they are not allowed access to many job opportunities. There are only certain jobs that as Palestine refugees they can work in. In Jordan their situation is slightly better because they are given citizenship by the Jordanian government, except for what they call “ex-Gazan refugees”, people who when they used to be in Gaza were under an Egyptian not a Jordanian mandate. So ex-Gazans lack legal status in Jordan. In Syria, obviously the conflict has severely impacted the Palestine refugees; they have been displaced for the second time. They have had their rights violated again. Some of them had to flee Syria and go to Lebanon or Jordan. So we face different challenges in all these fields. RB: Do you have School Parliaments in all of the Fields? OE: Yes, in every school we have School Parliaments and this is something that we are really proud of because it allows children to participate actively in both the school life and the community life. And as much as possible we provide them also with support and guidance so that they can do these projects that benefit the whole community under the Human Rights Education Programme. School Parliaments play a huge role here as the children in the parliament are elected representatives of their schools. Elections get really serious and very emotional I can tell you! We have one School Parliament head and deputy head who goes for election at the area level. In Gaza for example, we have five areas, and in every area we have area-level Student Parliaments. They hold elections and they choose their representatives for the field level. 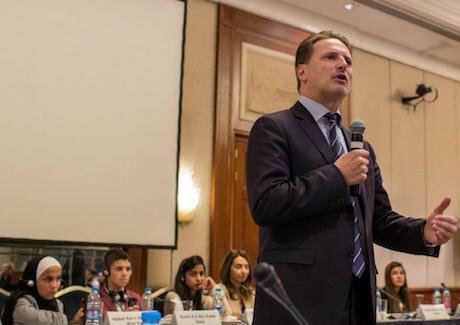 For the first time this year, the Commissioner General of UNRWA, Pierre Krähenbühl, launched an initiative to establish the first agency-wide student parliament. This initiative came from a meeting he had with school parliamentarians. He asked them how often they were in touch with students in UNRWA schools in Gaza, Jordan, Syria and Lebanon. When the answer was “never”, he felt it was his responsibility to open up such a space for the students, to explore the possibility of an UNRWA-wide student parliament to ensure they meet and that their voices are heard. We decided to design a process together with the children themselves, in which they could have a say in this agency-wide, student parliament. RB: How can you make sure that this huge impulse towards solidarity and Palestinian identity remains a celebration of diversity – is that important? OE: Firstly, these are school students who are involved at three levels. First of all they are already involved in their local communities. Secondly, we want them to be involved at the regional level as well as with UNRWA. We want them to have their voices heard. And to this end, for the first time in UNRWA’s history we had a management committee meeting last month in which these young people were representing themselves. They were standing up for their rights, and were telling the management what their needs were, saying, “let us support you to better support us.” UNRWA supports many aspects of their lives. We provide education, health services, relief and social services, camp improvements, and so on. The third level of participation we want them to reach is at the global level. And this is very important, because refugee children's voices are missing at that level. Even in this conference I didn't meet many – actually I didn't meet any refugees. I heard a lot of people including myself talking about refugees, but I wish we could have more refugees represented here. Recently we took some of the refugee children from the School Parliaments to a conference called ‘Children as actors for transforming society’ in Switzerland. They connected so quickly with children all around the world, it was something to behold. And they were regarded as a valuable resource. Imagine this was the first time they had left their camps, the first time they travelled and you should have seen their faces on the plane when they were asking, “are we really above the clouds?” For the first time they met people from around the world and easily engaged with them, because all the children participating, including the UNRWA students, share these fundamental human values. Our students were very much respected by young people from other countries, not only because people wanted to find out about the conditions they were living under, but sometimes because other young people wanted to consult them about their own problems. They were seen as wise people.